It is now a well-known fact that Hindu culture had spread to countries far beyond the frontiers of the present day India. One such country is Cambodia, now known as Kampuchea (‘Kamboja’ in Sanskrit) in South East Asia. The kingdom of ‘Kamboja’ is said to have been established by one Kambu-Svāyambhuva who had migrated from India; or by a brāhmaṇa, Kauṇḍinya by name, a ‘disciple’ of ‘Aśvatthāman.’ It had attained stability even by the 2nd-3rd century A. D.
Of the several vestiges of Hindu culture there, Hindu temples are the best. 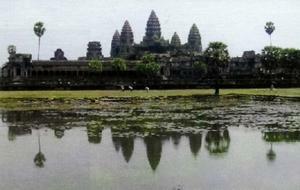 The Angkor Vat is the biggest of such temples discovered in the latter part of the nineteenth century. It was built by Sūryavarman II (A.D. 1112-1152), near his capital Angkor Thom. The Angkor Vat is a Vaiṣṇava temple of huge proportions built in the Draviḍian style. The temple area is rectangular in shape, surrounded by a moat 195 metres (650 ft.) wide and 3.8 kms. (2 1/2 miles) long. The side of the stone-flagged platform is nearly 900 metres (3000 ft.) in length. The temple walls contain carvings from the Hindu mythology, mostly from the Rāmāyaṇa and the Bhāgavata. The sculpture shows the effect of the Khmer culture also, original to the land.